You may searching for records meeting the specified parameters. To set criteria for searching records, click Edit | Find menu, or click the corresponding icon on the toolbar. Find dialog box opens. To find next entry, click Edit | Find Next menu, or click F3. records with not empty field. 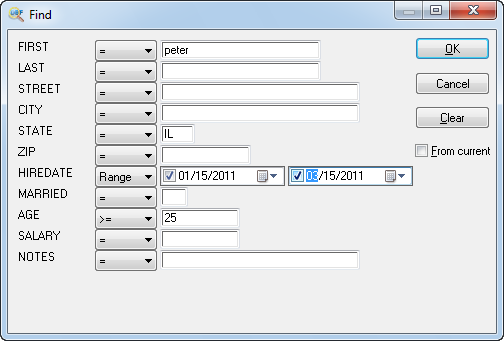 You can also set range for date/Timestamp fields and all numeric types.